Preheat oven to 350°F (180°C). Grease and dust 24 mini muffin cups with flour; set aside. Add piece of peanut butter bar to each muffin cup. Prepare brownie mix according to package directions. Divide batter evenly into each muffin cup. Bake for 15 to 18 minutes or until only a few moist crumbs stick to a toothpick when inserted into the centre of the brownie. Let cool completely in pan. Remove from pan. Scrape icing into a small re-sealable plastic bag; snip corner. 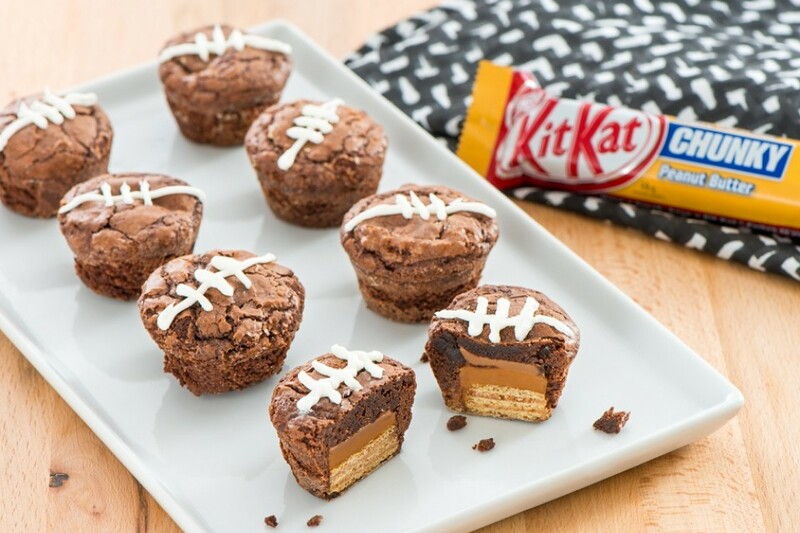 Pipe icing to resemble the stripes and laces of a football on each brownie.